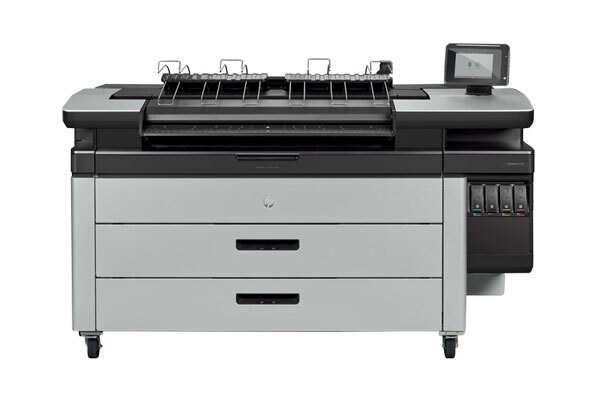 ﻿ HP PageWide XL 4600 Printer - Print-O-Stat, Inc.
1 Fastest based on alternative low-volume LED printers and MFPs (under 7 D/A1 pages/minute) as of November, 2018. Operational costs based on low-volume LED technology under $20,000 USD in the market as of November, 2018. Operational costs consist of supplies and service costs. For testing criteria, see hp.com/go/pagewidexlclaims. 2 Once image is selected, one-click printing when printing the entire file without any modifications to the print settings. Applicable to PDF, JPEG, TIFF, and HP-GL/2 files. HP PageWide XL PostScript/PDF Upgrade Kit required for HP PageWide XL 4600 series printers. 3 Multifunction capabilities are available on the HP PageWide XL 4600 Multifunction Printer only. 4 Conclusions based on internal HP testing for a specific use scenario. Comparable printers using LED technology based on LED printers capable of printing 4-6 D/A1 pages per minute and which represent more than 80% of the share of mid-volume LED printers in the US and Europe according to IDC as of November, 2018. For testing criteria, see hp.com/go/pagewidexlclaims. 5 For output produced with HP PageWide XL printers and LED printers from different manufacturers and that represent greater than 50% of the annual shipments of LED printers in North America as of 2018 according to IDC. For testing criteria, see hp.com/go/pagewidexlclaims.